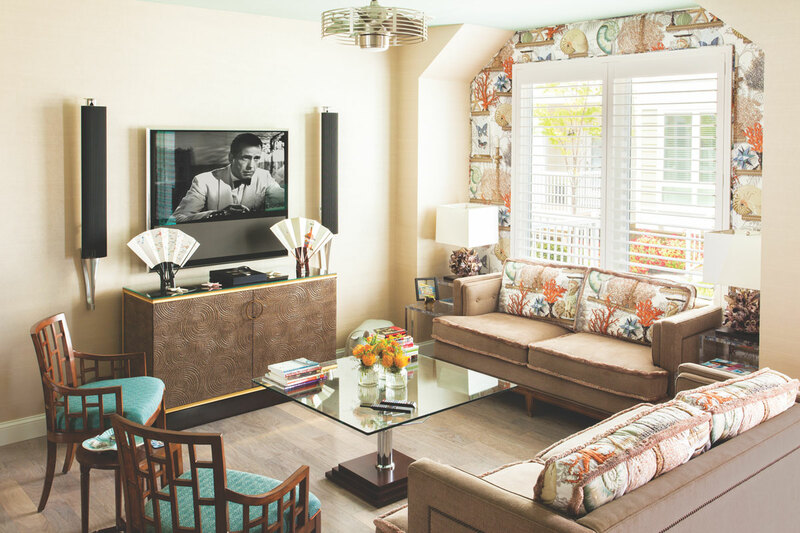 The Cowtan & Tout fabric on the window wall and sofa cushions in the living room was the starting point for the décor in the entire home. KITCHEN | Inverted Baccarat crystal goblets were transformed into pendant lighting over the kitchen island. Streamlined cabinets offer a sleek, simple look that contrasts with the detailed wall covering in the adjacent dining area. 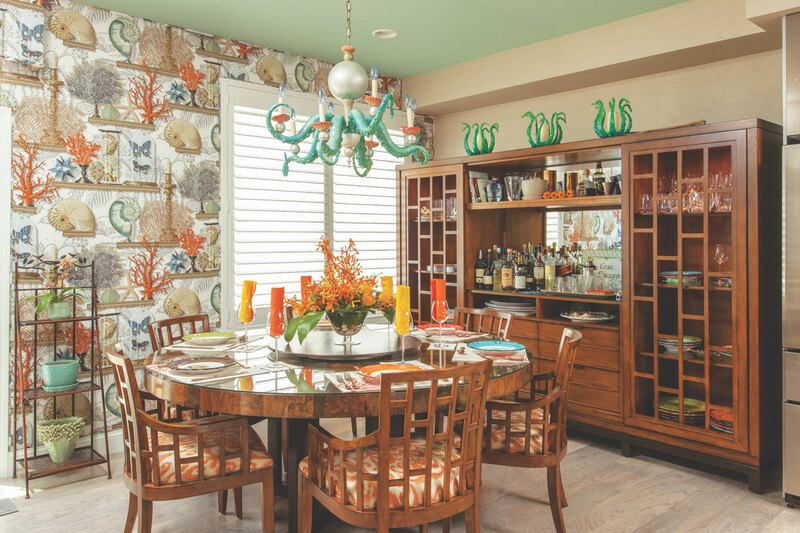 DINING AREA | Adam Wallacavage, a Philadelphia artist, created the octopus chandelier and candleholders on the cabinet. Those pieces, along with the tableware, mimic the colors in the wall covering. 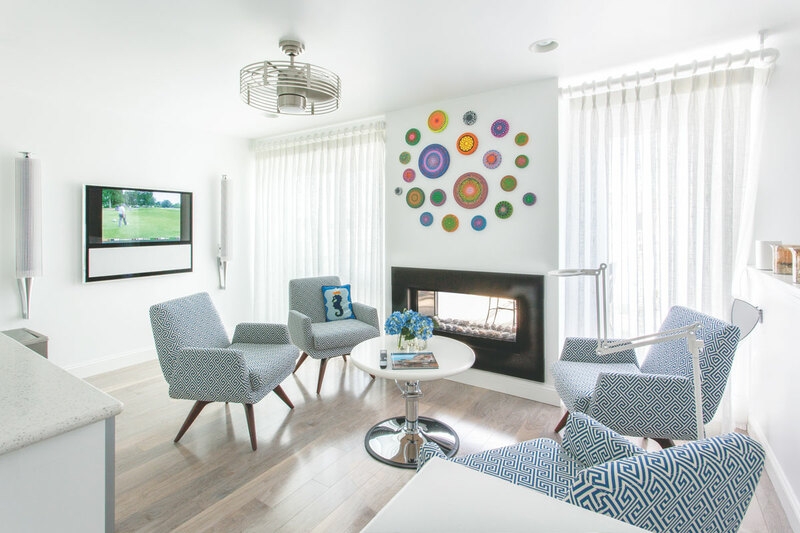 LOUNGE | Armchairs, along with the multicolored discs above the fireplace, add pops of color to the otherwise monochromatic lounge. The discs are by Asbury Park artist Darren McManus. LOUNGE KITCHEN | The kitchen in the fourth-floor lounge is “sort of a catering kitchen,” designer John Chadwick explains. It features warming ovens and a full stock of spirits. “We wanted the master bathroom to support rather than compete” with the master bedroom, Chadwick says. 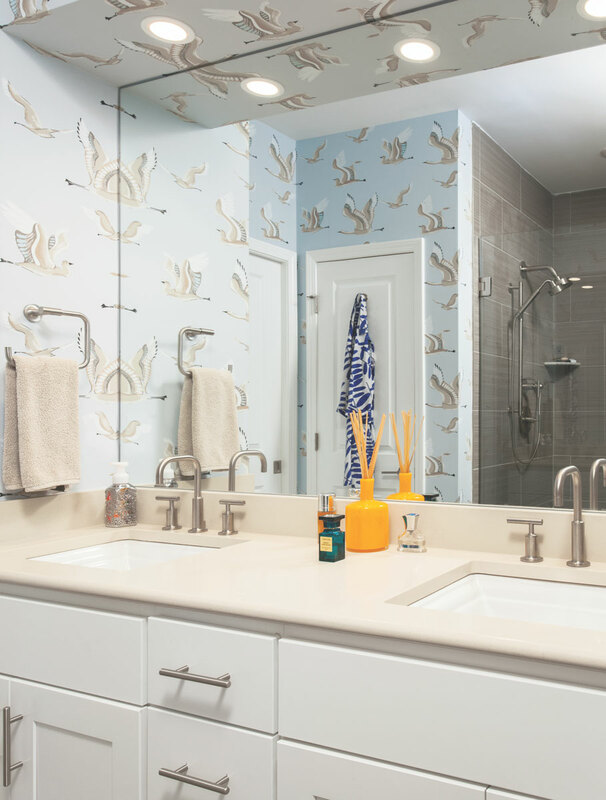 Seagulls on the wallpaper are in keeping with the seaside theme and coordinate with the shower tiles, which were there when the clients purchased the home. 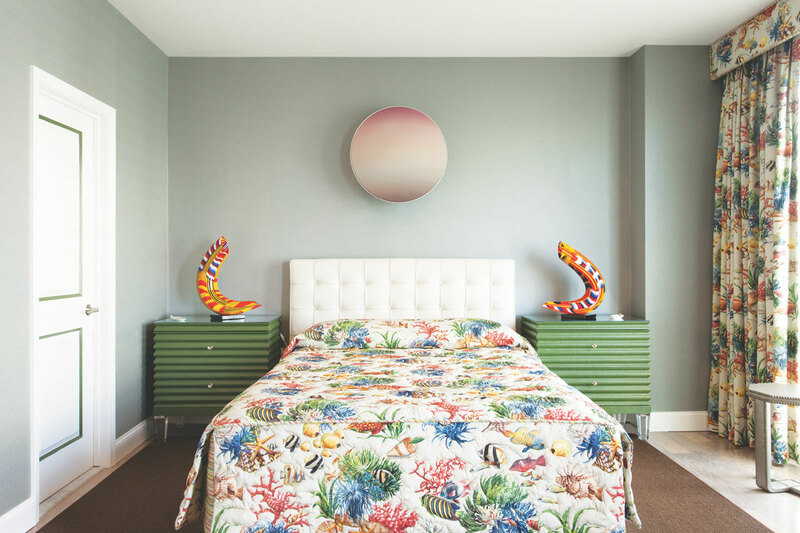 An Asbury Park, NJ, home is sophisticated yet lively. It all started with a piece of fabric, designer John Chadwick says. The textile in question—Le Cabinet Curiosites from Cowtan & Tout—features conch shells, butterflies and coral in shades of brown, orange and green. 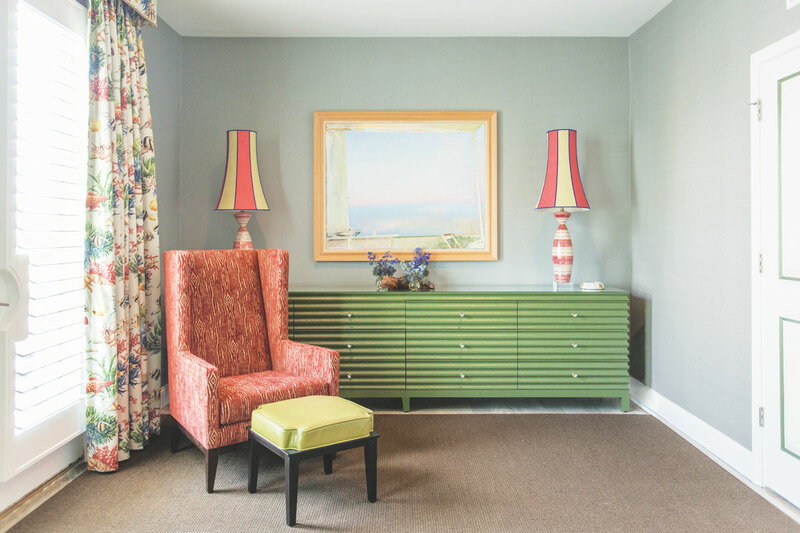 “The owners found that fabric and said ‘take it from here,’” says Chadwick, a member of the American Society of Interior Designers and owner of Interiors by John Chadwick in New York City. The whimsical fabric was a starting point. “We drew the floor plan and decided where we were going to use the fabric and how we were going to carry it through,” he says. The fabric covers a wall in the open-plan living/dining room and features prominently in the sofa cushions. In the kitchen, the lighting manages to be both unpredictable and classically chic. “The pendants over the island are Baccarat goblets turned upside down,” Chadwick notes, adding that Baccarat offers this service on a custom basis. Fun and games were on the homeowners’ minds in the living room, where the central table can be raised from cocktail height to bridge height. “In the summer, there’s always a jigsaw puzzle going,” the designer says. The upstairs lounge acts as an extension of the balcony just outside. When the door is open, “there’s a seamless transition to the terrace so it all seems like an aerie, a refuge in the clouds,” Chadwick says. The table in the lounge is also hydraulic to accommodate impromptu card games. During those card games, dinners or whatever the activity of the moment might be, there’s background music to set a mood. 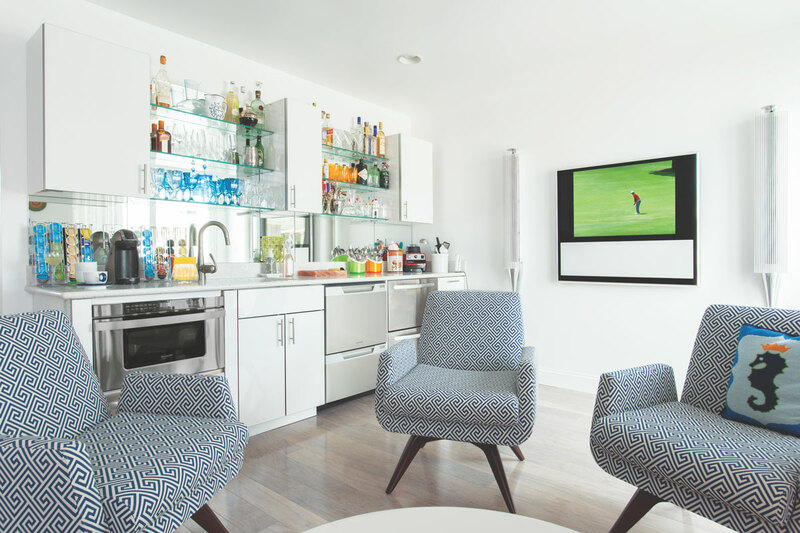 Televisions in the living room and lounge are flanked by speakers connected to a sound system that streams throughout the entire residence. Another speaker over the bed in the master bedroom changes color according to the music. Music, card games, jigsaw puzzles—these aren’t the only forms of entertainment. The homeowners “love cooking as theater,” Chadwick says. “They are both wonderful cooks and encourage people to help. 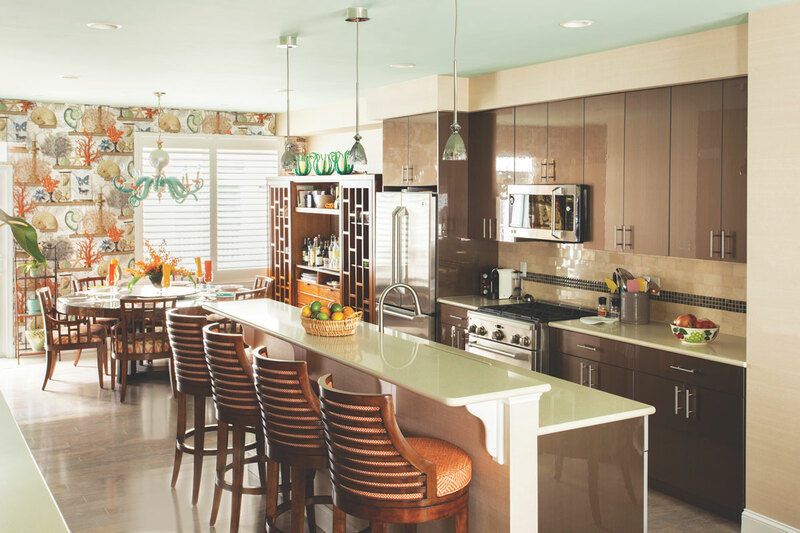 They wanted an open kitchen where they could cook and be with their guests at the same time. The décor in this home reflects not only the owners’ sense of fun, but also their sophistication. “They are world travelers,” Chadwick says. “They especially like Japan and Italy.” So they chose to accessorize their home with many mementos of those countries. In the living room, delicate Japanese hand fans feature prominently on a cabinet. In a bedroom, a Japanese poem, enlarged to become a work of art by a friend of the homeowners, is a focal point. 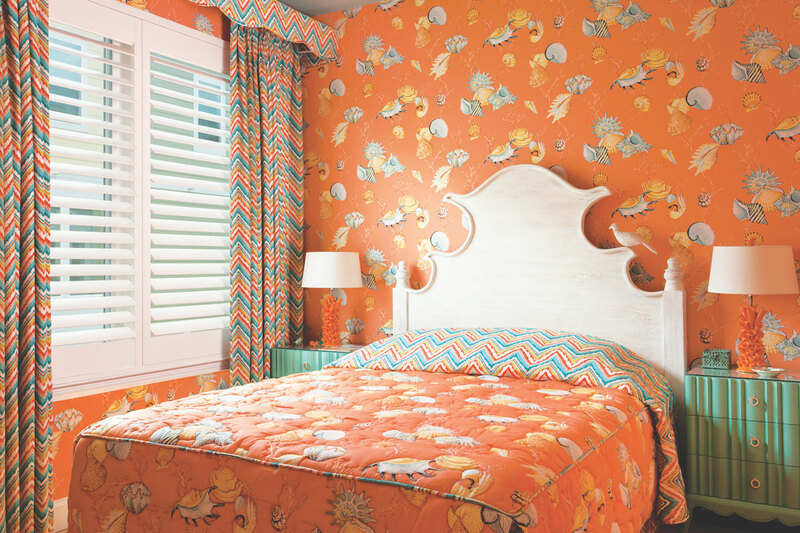 Italian midcentury matching lamps adorn a dresser in the master bedroom, repeating the orange from the living room wall covering and coordinating with the bedding, window treatments, armchair and accessories. The lamps flank a painting by a Sicilian artist that was purchased in Positano, Italy. The table and chairs on the deck are also from Positano. Overall: design, Interiors by John Chadwick in New York City; hardwood shutters, Heritance from Hunter Douglas. Living Room: sofas, Henredon; console, Barbara Barry for Baker Furniture; armchairs, Lexington Home Brands; wall covering on window wall and back cushions on sofas, Le Cabinet Curiosites by Manuel Canovas through Cowtan & Tout; wall covering on other walls, Innovations in Wallcoverings Inc. in New York City; television and speakers, Bang & Olufsen; side tables, designed by John Chadwick; lamps on side tables, Arteriors Home in Carrollton, Texas; fans on cabinet, Miyawaki Baisen-An in Kyoto, Japan; cocktail table, Apropos in New York City. Kitchen: wall covering on cabinet wall, Innovations in Wallcovering; bar stools, Tommy Bahama Home; pendant lights over counter, Philippe Starck for Baccarat in New York City; cabinetry hardware, Simon’s Hardware & Bath in New York City; appliances, ABL Appliance Brokers Ltd. in Englishtown; faucet, Kohler; countertop and backsplash tile, Caesarstone USA. Dining Area: wall covering, Le Cabinet Curiosites, Manuel Canovas through Cowtan & Tout; wall covering on other walls, Innovations in Wallcoverings; octopus chandelier and candle holders, artist Adam Wallacavage in Philadelphia; dining table, Serrucho by Taracea in Miami; Italian copper flatware, Oro Due from Mepra in Brescia, Italy; dinnerware, Ceramiche Casola in Positano, Italy. Lounge: wall color, Benjamin Moore Decorator’s White; round table, Henredon; ceiling lamp, Fanimation in Zionsville, Indiana; seating, Apropos in New York City with fabric from Schumacher; round paintings over fireplace, Darren McManus in Asbury Park; television and speakers, Bang & Olufsen; countertop, Caesarstone USA; faucet, Kohler; appliances, ABL Appliance Brokers Ltd.; custom glass shelving, Interiors by John Chadwick. Master Bedroom: wall covering, Innovations in Wallcoverings; curtains and bedspread, Stark in New York City; duster fabric, Lee Jofa; custom night tables, custom dresser and custom white leather headboard, Apropos; speaker above headboard, Bang & Olufsen; side table lamps, Mambo from La Murrina Murano in New York City; custom lampshades, Blanche Field in New York City; painting, Sicilian artist Franco Polizzi; chair and ottoman, Henredon; carpet, Sanford Hall in New York City. Master Bathroom: wallpaper, Manuel Canovas for Cowtan & Tout; countertop, Caesarstone USA; shower tile, Nemo Tile & Stone in Red Bank; shower and sink faucets and towel holder, Kohler. Orange Bedroom: fabrics and wall covering, Schumacher; lamps, Arteriors Home; bed, Ballard Designs; side tables, Lexington Home Brands. Orange Bathroom: wall covering, Quadrille Fabrics in New York City; countertop, Caesarstone USA; faucet and towel holder, Kohler. Striped Twin Bedroom: wall colors, Benjamin Moore Decorator’s White and Navy; fabric, Duralee; lampshade, Blanche Field; headboards and custom night table, Apropos; ceiling light, Fanimation. Toile Bedroom: wall color, Benjamin Moore Charcoal Gray; headboards, Apropos; bedding and headboard fabric, Pierre Frey Inc. in New York City; armoire, Ballard Designs; wood blinds, Parkland from Hunter Douglas; light fixtures, Metropolitan Lighting in New York City; flooring, Porcelanosa. Toile Bathroom: wall covering, Pierre Frey Inc.; tile mirror, Josh Hilzendeber at Opus Mosaic Mirrors in Missoula, Montana; faucet and towel holder, Kohler; chairs, Koverton in City of Industry, California; fabric on chairs, Missoni Home in New York City; table, Ceramiche Casola; grill, Fire Magic Grills; flooring, Trex Co. Inc.